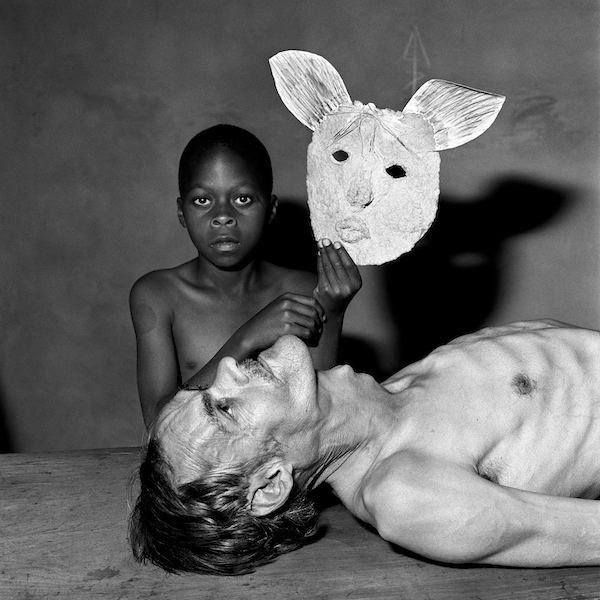 Roger Ballen, Tommy, Samson and a Mask, 2000. Photograph, 40 x 40cm. Courtesy: the artist and GAGPROJECTS, Adelaide. This is a major retrospective of one of the most important photographic artists of the past 150 years. Roger Ballen is a New Yorker by birth who has lived and worked in South Africa since the 1980s. Over the past 30 years his distinctive style of photography has evolved using a simple square format in stark and beautiful black and white. His job as a geologist led him to take up his camera and document the hidden world of small-town squatter camps and mine dumps, at first using square portraiture in black and white but eventually integrating drawing, painting, animation and even theatre into his practice to create a whole new hybrid aesthetic of visual art. In his earlier works his connection to the tradition of documentary photography is clear but through the 1990s he developed a style he describes as ‘Ballenesque’.